An irrational fear or refusal to try new foods is called food neophobia. This is common during infant development but can become a habit during adulthood. According to a new study conducted by researchers at the University of the Basque Country in Spain, neophobic children have a lower Mediterranean dietary quality index (this index is a tool used to evaluate the diet quality of a Mediterranean population). Researchers discovered that the rejection of food could also lead to a greater risk of anxiety and reduced self-esteem. Edurne Maiz, a researcher at the University’s Faculty of Psychology, conducted the study for her PhD thesis; it involved 831 children between the ages of eight and 16. Questionnaires on infant neophobia were adapted for the study. The children were asked if they were open to eating new foods. Data was also collected about body composition, diet, physical exercise, anxiety, self-esteem, and parental dietary styles. Researchers concluded that neophobic behavior has a big impact on the diet since it decreases the variety of foods that children consume. Neophobic participants exhibited a lower Mediterranean dietary quality index, primarily due to the decreased consumption of vegetables and fruits. They also consumed greater amounts of foods often deemed appropriate for occasional consumption. The study also found that the neophobic children reported their parents had given them less control of food choices than the parents of neophilic children—children who eat pretty much everything and often try new foods. 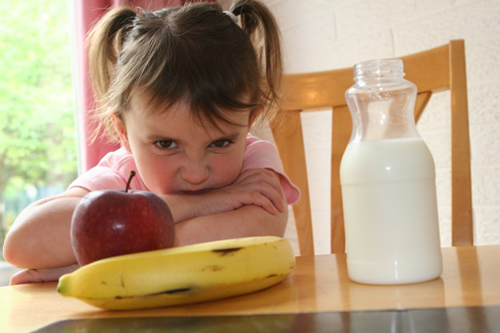 When children reject food it can cause frustration with the parents, and that can negatively affect the emotional state of the children. The data led researchers to believe that neophobic children and adolescents have greater anxiety compared to neophiliacs. The neophobes also had lower self-esteem within the self-concept of emotions, physical appearance, social life, family life, and academic studies. Adolescent neophobes had lower self-esteem within the self-concept of physical appearance and family life. There were no significant differences between the two groups with body composition. Maiz stresses that food neophobia may develop when there isn’t a strong parental bond with the child. She recommends that parents create a pleasant and relaxed atmosphere during mealtime, and that children help with food shopping and preparing meals. Maiz, E., et al., “Neofobia y otros trastornos restictivos alimentarios en la infancia y consume de fructas y verduras,” Revista Espanola de Nutricion Comunitaria, ISSN 1135–3074, doi: 10.14642/RENC.2014.20.4.5029. “The fear of trying new foods may have negative dietary implications,” ScienceDaily web site, August 26, 2015; http://www.sciencedaily.com/releases/2015/08/150826082230.htm.